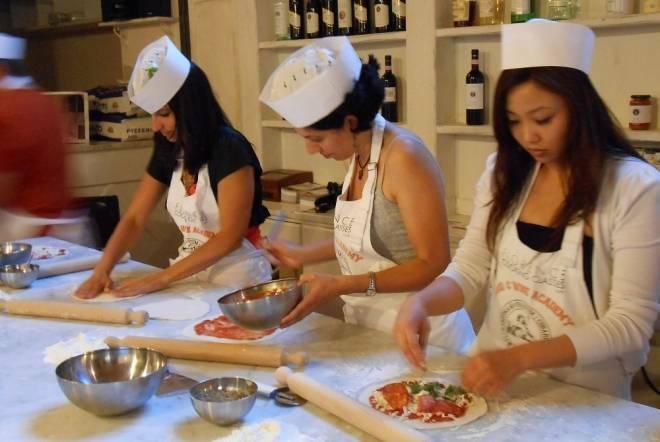 Learn how to make pizza and gelato just like the Italians do! Join our late afternoon class! Our chefs will be happy to introduce you to the history of these glorious Italian creations! Make pizza with our professional pizza chef, called “pizzaiolo”. You will learn how to make tender, flexible yeast dough that stretches to almost paper-thinness and the trick for a flavorful yet light tomato sauce. Even if you bake pizza in your own oven, these techniques are universal and using them really makes the difference. With the pizzaiolo, you’ll make your very own pizza, you’ll stretch it, sauce it, bake it, slice it. It will be the best pizza you’ve ever tasted and you will have made it yourself! Come make pizza in Florence! The chef will tell you why gelato remains Italy’s favorite dessert while giving insight on the ‘gelato culture’ that continues to grow. You will get to know the basic raw ingredients, how to select the best products available according to specific principles, and you will have a presentation and tasting of some of the flavors used in the gelato making. You will learn about the development and application of natural colors, the heating and freezing techniques and how they have different effects on ingredients. It is always a great day to discover the recipe of the world’s most loved dessert! At the end of the lesson you will enjoy a dinner of the pizza and gelato you made during the lesson. This activity is strongly recommended for families that wish to have their children learn about Italian culture. It’s an easy and fun experience that will last forever in their memory. Pizza and gelato lesson with famous local chefs. All ingredients for pizza and gelato making. Dinner with wine (soft drinks for children).